The poll indicates whichever Republican wins Tuesday will have a close race with Democrat Stacey Abrams in November. 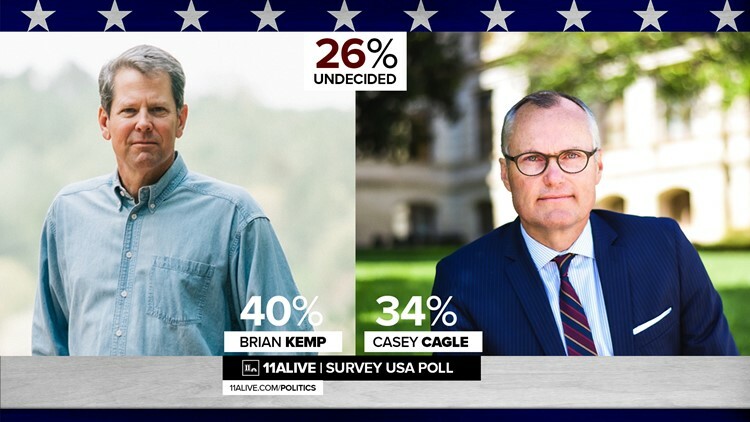 ATLANTA – Though Brian Kemp may have an edge going into the final weekend of the Republican gubernatorial primary, a new 11Alive / SurveyUSA poll shows Kemp’s runoff with Casey Cagle could go either way Tuesday. The poll of 688 likely Georgia voters in the GOP runoff shows Kemp with 40%, Cagle with 34% and an extraordinary 26% still undecided. The poll sampled voters who had already voted early, as well as voters SurveyUSA determined were likely to cast ballots by Tuesday. The poll has a “credibility interval” of plus or minus 4.7 percent. The poll was in the field from July 15 to July 19. During that time, Gov. Nathan Deal endorsed Lt. Governor Cagle, and President Donald Trump endorsed Secretary of State Kemp. It’s possible the conflicting endorsements from two popular GOP leaders, plus relentless attack ads from both sides, have contributed to indecision among Republican voters surveyed. It’s also possible at least some of the undecided voters surveyed early in the week made decisions after Trump endorsed Kemp. The poll indicates Cagle is stronger in metro Atlanta, while Kemp is much stronger in rural Georgia. It also shows Kemp stronger among middle income voters (from $40,000 to 80,000). Apart from that, it shows the two candidates are closely matched across gender, age, and education lines. It also shows undecided voters well represented among all those categories, with urban GOP voters more likely to be undecided than suburban or rural voters. HOW THIS POLL QUESTION WAS CONDUCTED: SurveyUSA interviewed 2,950 adults from the state of Georgia 07/15/18 through 07/19/18. Of the adults, 2,423 were registered to vote. Of the registered voters, 688 were determined by SurveyUSA to have already voted in the Republican runoff, or to be likely to return a ballot before the Tuesday 07/24/18 deadline. The poll indicates whichever Republican wins Tuesday will have a close race with Democrat Stacey Abrams in November. The poll shows Cagle beats Abrams 46 to 44% in a hypothetical matchup now, and Kemp wins 45 to 43%. The “credibility interval” for that question is plus or minus 4.3 percent. 1) If the November election for Georgia governor were today, and the only two candidates on the ballot were Republican Casey Cagle and Democrat Stacey Abrams, who would you vote for? 2) If the November election for Georgia governor were today, and the only two candidates on the ballot were Republican Brian Kemp and Democrat Stacey Abrams, who would you vote for? ►RELATED: Voteable: Who can vote in Georgia's July 24 primary runoff election? HOW THIS POLL WAS CONDUCTED: SurveyUSA interviewed 2,950 adults from the state of Georgia 07/15/18 through 07/19/18. Of the adults, 2,423 were registered to vote. Of the registered voters, 1,199 were determined by SurveyUSA to be likely to vote in the 11/06/18 general election. This research was conducted online.